Just to make things a little confusing there are two versions of Studio Max, Autodesk 3D Studio Max and Autodesk 3D Studio Max Design. Autodesk 3D Studio Max is more suited for Games Developers, Film and Motion Graphics, whereas Autodesk 3D Studio Max Design is generally used by Architects, Designers and Civil Engineers. The main differences between the two products are as follows, Autodesk 3D Studio Max has “SDK” (software development kit). This is not included in Autodesk 3D Studio Design, whereas Autodesk 3D Studio Max Design has “Civils View Feature Set” and “Exposure Lighting Simulation and Analysis”, which is not included in Autodesk 3D Studio Max. Follow the link below to compare the two products. Autodesk 3D Studio Max Design and Autodesk 3D Studio Max are both available as standalone programmes or as part of some of the Autodesk Design Suites, whereas Autodesk 3D Studio Max is part of the Media and Entertainment Suite. 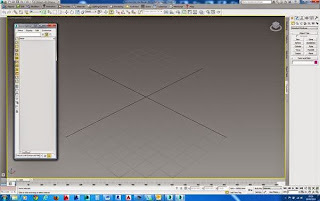 Autodesk 3D Studio Max Design is part of the Building Design Suite it may be the product of choice for many users, both Max products can be loaded onto and will run on the same PC without any problems. 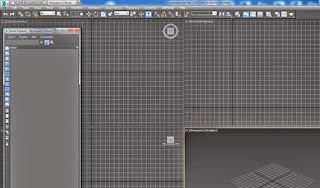 On initial start-up the big difference is the working background, Autodesk 3D Studio Max has a dark background. There are also other differences like the default renderer. 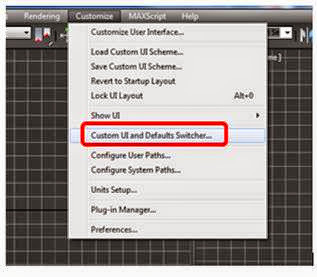 With Autodesk 3D Studio Max open and a new scene created, from the drop down menu select“Customize”, from the displayed drop down list select “Custom UI and Defaults Switcher”. The “Choose initial setting for tool options and UI layout” dialogue box is now displayed. The dialogue has two lists, on the left “Initial settings for tool options” and on the right “UI Scheme”. 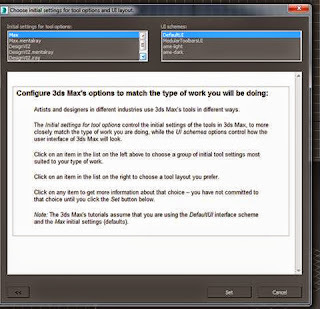 The original settings for Autodesk 3D Studio Max are “Max” in the list on the left side and “Default UI” in the list on the right. From the list on the left select “Max.Mentalray” , and from the list on the right select “Ame-light”3D Studio Max will now look like 3D Studio Max Design. Once these have been set, by scrolling down the dialogue a breakdown of how the made changes will affect the programme. Mental ray is now the default renderer and real world texture co-ordinates will be applied when creating materials and applying mapping co-ordinates. Click on “Set” and the interface will change, but it is better to close and restart the application for the changes to take effect. From this point on 3D Studio Max will have look and feel as 3D Studio Max Design. 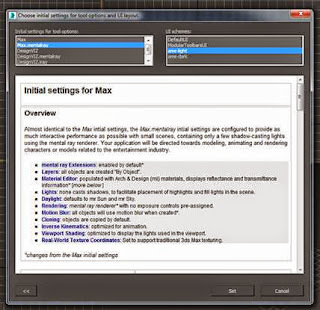 If a later date changes need to be made to reset 3D Studio Max to its previous settings this can be accomplished by changing the relevant options to that effect and restart the application.